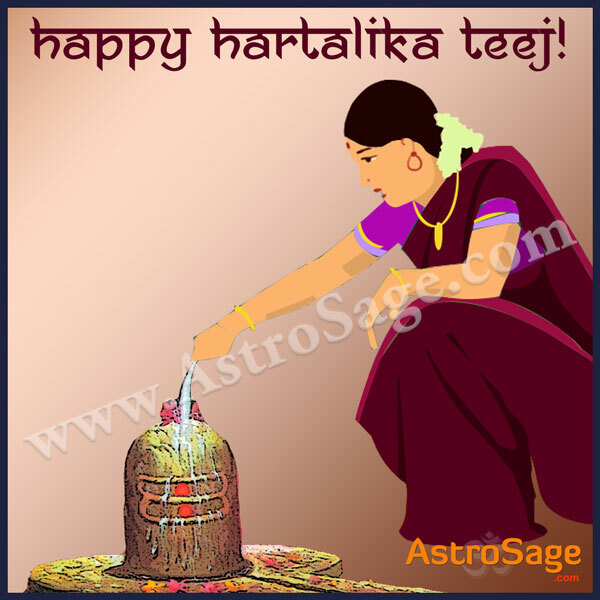 Know early morning Muhurat, rituals, and other important things about Hartalika Teej and feel blessed. It is one of the ancient festivals of India; make the best of it. Worship Lord Shiva and Goddess Parvati. Observe a full day Nirjala (without water) fast. Worship Lord Shiva and Goddess Parvati in the evening. Offer clothes and cosmetic items to Mata Parvati like Saree, Kohl (Kajal), vermilion (Kumkum), turmeric (Haldi) and flowers. Offer Dhoti (lioncloth) and Angocha (Towel) to Lord Shiva. Donate the cosmetic items to the wife of a saint and Dhoti and Angocha to Brahmin. Offer 13 varieties of sweets to your mother-in-law and seek blessings. Recite or listen Teej Vrat Katha and break your fast after sunset. It is believed that women can get all their wishes fulfilled by observing this Vrat.